How 2 New Yorkers Erased $1.5 Million in Medical Debt for Hundreds of Strangers. If a slim, yellow envelope with a Rye, N.Y., return address lands in your mailbox this holiday season, don't throw it out. It's not junk. Over the summer months, the women raised $12,500 and sent it to the debt-forgiveness charity, which then purchased a portfolio of $1.5 million of medical debts on their behalf, for about half a penny on the dollar.Ms. 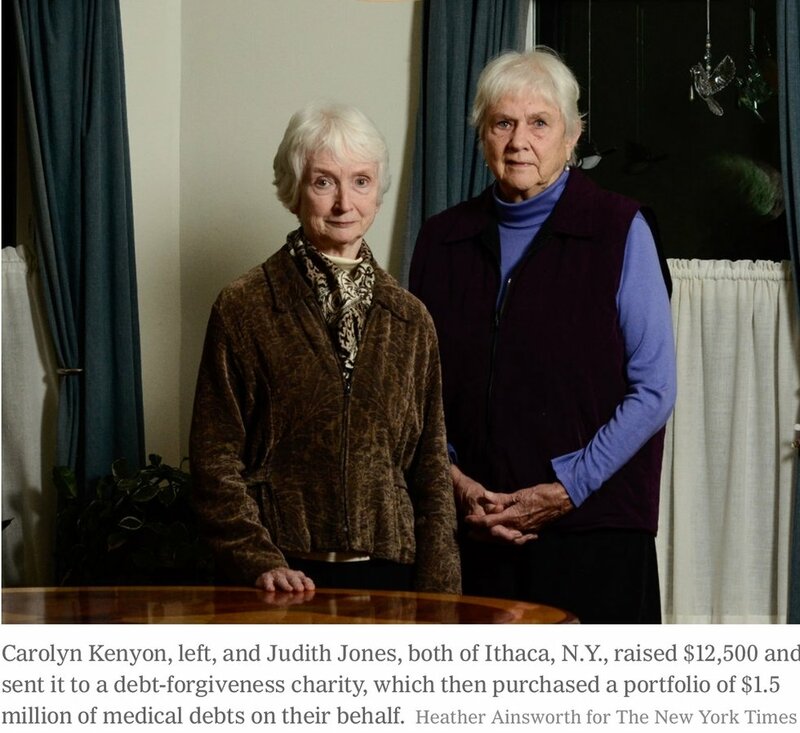 Jones, 80, a retired chemist, and Ms. Kenyon, 70, a psychoanalyst, are members of the Finger Lakes chapter of the Campaign for New York Health, which supports universal health coverage through passage of the New York Health Act. "The way sort of opened," Ms. Jones said. They cast a wide net for donations, she said, explaining to people that the campaign was only a short-term fix for the larger problem of out-of-control medical costs. The 1,284 New Yorkers who had their debts forgiven live in 40 of the state's 62 counties, from Westchester to Chautauqua. The sources of the debt were some 130 hospitals and branches that had provided medical services, R.I.P. Medical Debt said.It has become increasingly easy for regular citizens to purchase bundles of past-due medical bills and forgive them because of the efforts of the debt-relief charity, which was founded in 2014 by two former debt collection industry executives, Craig Antico and Jerry Ashton. After realizing the crushing impact medical debts were having on millions of Americans, the men decided to flip their mind-set. They began purchasing portfolios of old debts to clear them as a public service, rather than try to hound the debtors. "I like doing this much more than I liked doing collecting," Mr. Antico said. R.I.P. Medical Debt had its first star turn in 2016, when John Oliver did a segment on his HBO show "Last Week Tonight," in which he paid $60,000 to forgive $14.9 million in medical debts through the charity. About 9,000 people received the yellow forgiveness envelopes as a result. "It is a drop in the bucket," Mr. Antico said. Mr. Antico said he thought of his charity as a "resolutionary, not a revolutionary" effort, one that offers people relief, but that cannot solve underlying issues like high medical costs. Through personal data associated with the debt accounts, they are able to target specific classes of people, such as veterans, to relieve their debts. "I do like the idea that people do not have to ask for help," he said. "The random act of kindness is kind of a cool thing." The envelopes from Ms. Jones and Ms. Kenyon's gift went out in November, but new letters are going out all the time. And don't worry. Even if you throw your yellow letter out, your debt is still forgiven. You just might not know about it until the next time you run your credit. Post Script. I enjoyed reading this. So I thought you too. "Do as much good as you can for as long as you can" - @HillaryClinton.